Click on drone name to quick scroll, or click Reviews to read independent customers reviews and to check its price. Or just scroll down to continue reading. Enjoy! Many adults are catching onto the big drones craze. 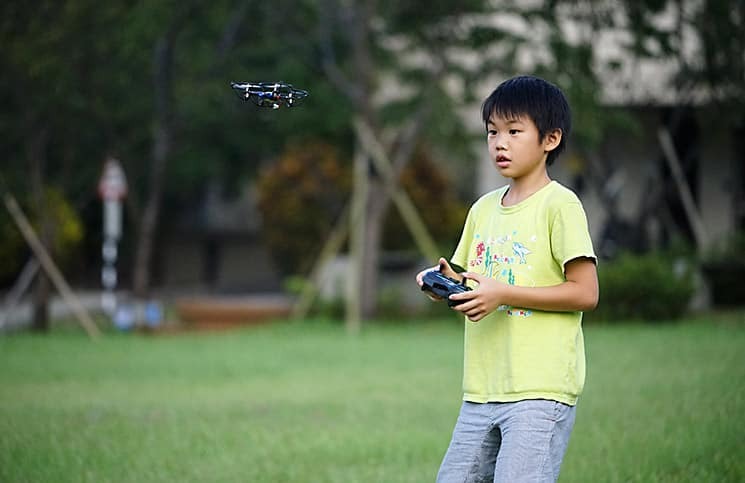 It began with buying kids remote controlled cars and trucks, progressed to boats and helicopters, and now quadcopters are one of the most popular RC toys today. A quadcopter is similar to a helicopter but it has four rotating blades instead of just one. This means that each quad contains four motors which help to keep it stabilized in the air. While they look fun and easy to fly, often that’s far from the truth. It’s best to find a drone for beginners for a variety of reasons. 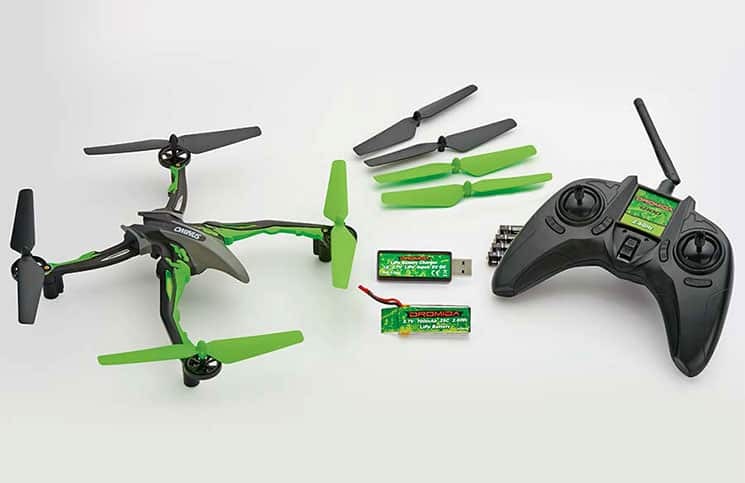 A starter quadcopter can vary in price from $20 to $200 and more. If you’re new to the field of quads you probably don’t want to risk a larger investment. Flying drones can be trickier than you think. There’s the hazard that they can crash into buildings or walls and break. If you’re flying them in an outdoor setting, you may lose them in a lake or up a tree. Or worse, your neighbor may send you a bill because you damaged their prize rose bush. It’s best to choose a beginner quadcopter. Most beginner’s drones start at a low price point and they have additional features such as a six axis gyro system that enables it to easily stay upright in the air. Many beginner drones also have special features such as blade guards and are made from resilient and durable materials that resist chipping and cracking. Their motors are encased within protective housing so if the drone crashes, the motors don’t break. Almost all starter drones have four running lights, but some of the cheaper models may have none. Bright LED running lights can help the eye to view the drone out to farther distances. LED lights also help to see your quadcopter when it’s dark outside. Finding the best drone for beginners will not only ease any worries that you’ll damage or lose it, but it’ll also be a great way to learn on a starter quadcopter. In order to find the best drone for beginners it’s important to learn about five of the top quadcopter manufacturers today. UDI, Parrot, Syma, Hubsan and Dromida all make great beginner’s quadcopters. You may wish to consider a purpose for the drone beginner. Are you buying it for your children? Consider their age range. Children 14 years and older may need minimum supervision. For younger children you’re going to need to learn how to fly it first, so that you can then teach them how to fly a drone. Is this to be a gift? You may need to have additional features to impress your friend. Will the best starter drone be for yourself? Do you want to have the ability to take photographs and record video? If you’re purchasing an entry-level model most won’t take professional quality images, but these are great for learning how to take snapshots in the air, and to record video. Have a look at each of these models and see which may be right for you, your family, or as a gift. 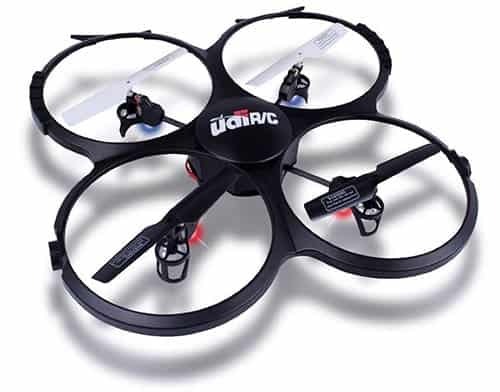 The UDI U818A is not necessarily in the drones for beginners class as many experienced drone pilots buy this model, but it has some unique features to capture the interest of someone who doesn’t know where to start. It’s possible it’s one of the best quadcopters for beginners as it features four wide circular rings that cover each of the rotors and join together at the middle. This make it larger than other quads, yet provides an additional layer of protection. This black blade guard not only keeps dirt and debris from accumulating around the blades, but it also protects your trees and bushes, and your walls and furniture if you choose to fly it indoors. The drone is mostly black, but does have two white blades to help you discern its forward direction. Underneath each of the motors is rubbery feet to help the drone come in for a soft landing. Encased under the body of this drone is a built-in camera. The UDI U818A has HD quality and an impressive 1280×720 pixels. It records video at 30 frames per second. This is a great way to film amazing footage of your outdoor adventures. This is actually a great camera in this price range. You can expect to find it regularly priced at $100. Even though there are two white blades to help with forward orientation, there is also a headless mode so you can fly the drone forwards no matter which direction its head may be facing. This is a useful function for beginners who may have difficulty discerning the correct forward facing position in the air. A return to home function is also handy for a starter quadcopter. When this button is pressed the drone will come back to its original take-off position. This can be handy when the drone is running low on power, or your child is losing interest. It’s a great option to have on drones for beginners, preventing their loss or damage. The low voltage alarm will also alert you that it may be time to bring your UDI back home in order to minimize the risk of losing it. Because no one wants to run around in the dark trying to find a drone that has suddenly lost power and dropped out of the sky. The UDI can also do great tricks such as 360 degree flips and rolls to impress your friends. The UDI comes with a full-sized radio controller with real joy sticks. There are a lot of buttons on it, which is why you’ll enjoy the beginner’s mode to start while you learn how to fly your best starter drone. There is also an LCD readout screen that informs you which mode you’re in and how much power you have left. UDI U818A vs Syma X5C – Lets check what is better! If you have ventured into a new hobby of flying drones and would like to take photos or videos later once you have got a hang of it, but are wary about how to use it? Then here is a small toy that provides answers to all your questions. Learning how to fly many of the pro-level quads such as the Parrot Bebop can be difficult. Do you really want to invest that kind of money even before you know how to fly them? Absolutely not! So a clever to do is try your hands on a smaller version than then hit big. Some beginner quad pilots would expect even a basic version to be cool looking and loaded with features while it is still easy to fly. Keeping these demands in mind JJRC has developed a fancy looking hexacopter which is easy to fly and very much controllable when in air. The JJRC H20 is equipped with a great motor and battery system, easy to use remote controller, and has incredible flying capabilities. It has a built-in six axis gyroscope, and uses 2.4 G remote control technology. You can do some great tricks with the 3D rolling capability. 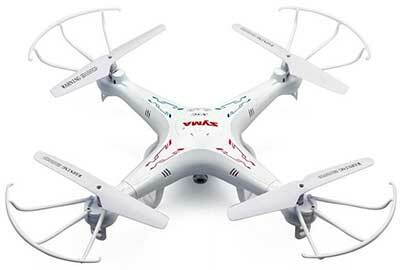 It does look smaller than the average quadcopter but its intuitive controls is what makes it special. The drone fits into your palm has the appearance of a hummingbird. The blades spins so quickly that you won’t even be able to spot them. The JJRC H20 has a variety of speed controls, so you can start out slow, and work your way up to pro level. 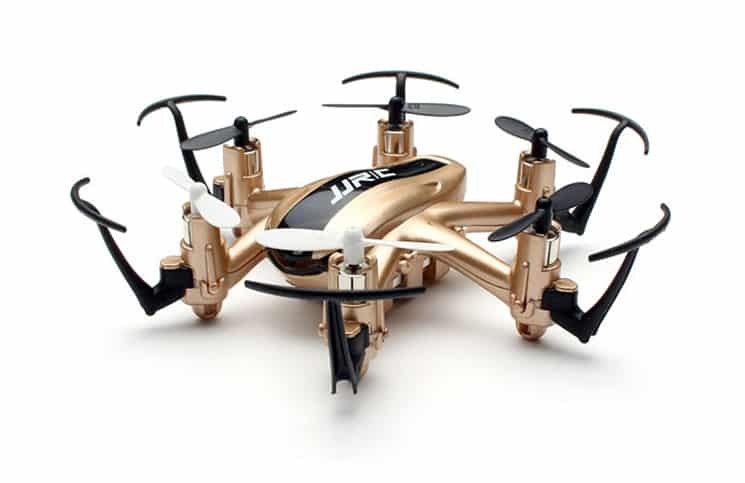 The JJRC H20 comes in two cool color choices: gold and black; and red and black.The hexacopter does not come with a camera, nor can one be easily attached. But the JJRC H20 is great for learning how to fly. The gyroscope is used to detect changes in the positioning of the hexacopter. As it flies through the air it can sense when there is a change in direction and can reposition itself in a pretty tidy manner. The 2.4GHZ frequency makes it for more accurate controlling while your drone is in the air. You’ll find that you can send your drone out to farther distances than any other compact quad, and that it responds immediately to your minute adjustments.The 360 degree roll over function enables you to perform cool rolling maneuvers in the air. There are six guard circles built on this drone, which protect each of the six rotating blades. They also have the advantage of protecting your walls, furniture, and outdoor components from the rotating blades of the drone. The Parrot Bebop is a pricier starter quadcopter, but it still falls into the best drones for beginners as it has some amazing safety features. Not only was it built with safety in mind, but it utilizes some advanced technology. The Parrot Bebop is built with lightweight materials so it can keep itself airborne more easily. It’s made from ABS plastic that is reinforced, and weighs about 400 grams in total. This also decreases any potential damage should it accidentally hit a tree or a human. In fact, if it collides with anything, the propellers will stop working and it will turn into emergency mode. This mode will pull the drone down into a landing position. The Bebop contains a GPS system so it can figure out where it originally took off should you press the return to home function. This prevents you from losing the drone should it be running low on power, or you are simply too tired to pilot it back to home manually. The Parrot AR.Drone 2.0 was made first, but the Parrot Bebop has a much more powerful motor than the Parrot AR’s motor. The Bebop has a navigation computer with Parrot P7 dual core computer, a quad core graphics processing unit, and eight gigabytes of flash storage that can store photos and video. 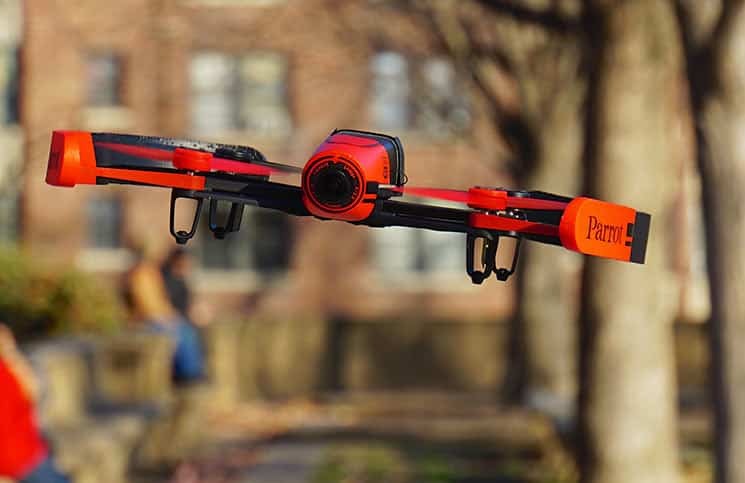 The Parrot uses Linux technology, and there is an SDK component that is available for software drone developers. The camera is attached to a sturdy magnesium shelf. This protects the camera from bumps and jolts, as well as heat from the four motors. It also helps the camera to film stable video footage. The camera has a fisheye lens to capture more of the landscape, and to look more natural than your regular video camera that you may attach to your drone. Many drones for beginners don’t generate their ownWiFi hotspot like the Parrot Bebop drone does. This is useful as you can run it with a variety of smart phones, tablets, and other types of devices, instead of the radio controller with the Freeflight App. 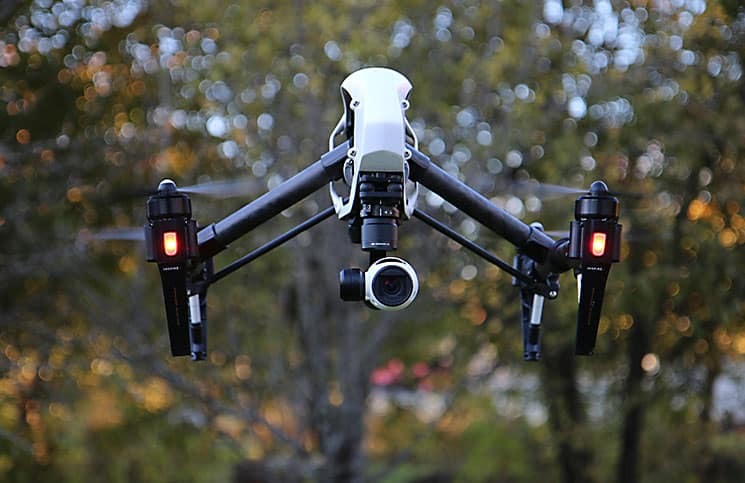 This gives you the opportunity to film the best video while also controlling the drone, rather than juggling a radio controller with a smaller video screen. It also allows your friends or family to watch the video, while you pilot the drone through the air. The Parrot can be quickly disassembled so you can pack it up for a trip or hiking. The blades can also be quickly changed should one become broken. The Syma X5C is also another option for drones for beginners. It is one of the best beginner’s quadcopters as it also has a high degree camera and a unique look that appears pro. It comes in a pure white plastic body with four white blades with curved blade guards. These protectors are made from a resilient plastic that will bounce back if they hit any surface. They also resist any cracking or chipping. There are two orange and two green LED running lights to help you to see it from a distance or in the dark. These lights flash, which will help you to see your best starter quadcopter more easily. There are four white landing feet. The camera is installed directly below the center of the body. Most drones for beginners or pros utilize the six axis gyro direction stabilizer. This helps to keep the Syma in the air. The 3D lock will keep your drone in hover position and you’ll find that you spend more time flying your drone, rather than worrying about how to keep it flying stable in the air. This gyro system is just part of the anti-collision and anti-fall system of this drone. This Syma X5C best starter drone can also do some great tricks! If you want to hide the fact that you bought this to be the best starter drone then you can impress your friends with its 360 degree eversion that allows it to do one roll, or a series of continuous rolls. The Syma comes with a great camera. If you’ve been searching through the best beginner quadcopter choices you may not have considered a camera, but it’s certainly a fun toy to have. It can extend the tools for a quadcopter beginner even though you don’t expect the best beginner quadcopter to have one. 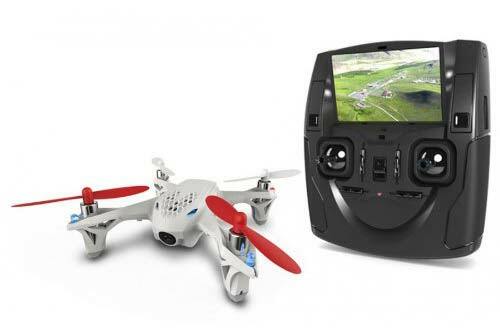 It has a high degree camera so you can take snapshots or videos of your flights. Like most quadcopters for beginners, the Syma X5C charges up with a USB cable. It can be plugged into the wall or the computer. It takes 100 minutes to charge up and provides about seven minutes of flying time. Even the beginner learning how to fly drones for beginners still wants a fully functional radio controller. Drone pilots will be pleased with the Syma and its full set of controls. There are so many great drones for beginners, but the Hubsan H107D is another worth noting. It has the distinction of being the world’s smallest FPV quadcopter with 480p camera. It comes in a white/grey plastic body with blue graphics and two red blades and two white blades. It has LED running lights so you can fly it in the dark. It can be the best drone for beginners as it’s perfect for flying around the home, or to be taken on a trip. Even though the drone is small, you still get a fully sized Hubsan radio controller unit with an actual 4.3 inch LCD viewing screen. This comes in a black plastic box with mini joysticks. There is a great full color sized screen so that you can see video as it’s being filmed. The radio controller works with 2.4Ghz technology. The Hubsan line may not look like quadcopters for beginners but it’s still one of the best drone for beginners due to its nifty safety features. The plastic materials in the Hubsan will resist bumps and scratches. All drones for beginners need to have a flip and roll function like the Hubsan. It will do one flip or roll, or several in a continuous motion. There are plenty of exciting features on the Hubsan H1067D for both the beginner and the advanced drone pilot so you won’t be putting it to the back of the closet any time soon. The Dromida Ominus may not be as well known a name for quadcopters for beginners but it’s a great option to look at. It has an exciting black and green body that looks more like a space creature than a quad. Ominus promises that it’s almost ready to fly out of the box—just charge up first. Ominus can also be the best drone for beginners as the company promises that it’s nearly impossible to break, but there’s enough to interest the intermediate flyer as well. There is flight assistance for beginners but this can be turned off for full manual control. Some other features that make this the best drone for beginners include the price tag of just under $80. Not only does it promise to be durable but it promises stable flight too. There’s even batteries in the box to help you get started! The gyro stabilization will help to keep the drone not only in the air but to keep it stable as well. Even if the beginner is a bit sloppy at the controls they won’t be embarrassed as flight will be stable, not erratic. The radio controller runs on 2.4Ghz technology. You can press a button and do some neat flips as there are some powerful motors in the quad. The secure link technology will ensure that your drone always stays in contact with the radio controller. All these features add up to a drone that is a dream to fly. What else can one expect for a best drone for beginners? There are four different color choices. You can choose from blue and black, yellow and black, green and black, or red and black. Since the radio controller has four channels you can buy up to four drones and fly them around your yard. It’s a great way to keep the kids from fighting, and the four colors allows each to see which drone they’re flying. You’ll want to decide on which is the best price point for your new drones for beginners purchase. 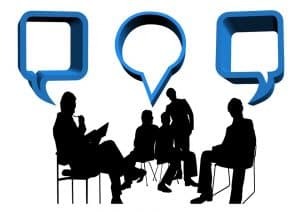 Do you want to pay the additional cost for a camera or is that not so important as you learn? Many people don’t want to worry about damaging their drone so extra safety features are important, as well as a six axis gyro to keep it in the air even when the beginner is uncertain how flight technology works. No matter which quadcopters for beginners you look at, anything in the UDI, JJRC,Parrot, Syma, Hubsan, or Dromida line is sure to keep you entertained for years on end.